After the whirlwind of the silly season, when most of us are guilty of over indulging, I decided to do a juice cleanse; teaming up with the good folk at Urban Remedy. I pride myself on healthy eating, but even I find it’s near impossible not to get swept up in the waves of Christmas holidays - for me that included a fabulous cruise with its endless parade of international treats tempting my taste buds every day! It’s a new year and that’s the perfect time to get back on track with healthy living! But a juice cleanse is not easy for everybody and, before you get started, there are some important steps you must take so your body is properly prepared. First, you should understand exactly what detoxing means. Put simply, it’s a process where your body expels any toxins. Toxins can include caffeine, alcohol, processed food, prescription and recreational drugs, chemicals (such as fungicides and pesticides) and artificial ingredients such as aspartame. It’s also important to remember that everyone detoxes at different rates and there are a variety of symptoms you need to be aware of. Some people suffer from headaches, tiredness and general irritability, where as others might simply feel a little less energetic than normal. With this in mind, it’s important you go about detoxing mindfully. Make yourself a green smoothie or juice for breakfast every day, leading up to your detox. For the two days prior, eat only unprocessed food, and go easy on the caffeine and alcohol. Be very strict about this, because this will help your body begin the detox process before you actually start the cleanse, meaning you may help alleviate some of the symptoms. Listen to your body. If you need to have a small snack, that’s ok. If you need to go easy on your workouts, no problems. Do what’s best for you. Make sure you stay hydrated! It might feel like you’re drinking lots of liquid, but this is so important to help flush out toxins. Stuck to water and green tea. Please don’t skip these vital steps. A detox was different for me as my body is used to raw foods and juices, so it wasn’t too much of a trial for me. Apart from sneaking in a snack (think a piece of fruit, a small handful of chopped veggies, half an avocado) here and there, I stuck to the rules, but it wasn’t difficult for me. Why? That’s because my brain is ‘always on’ and wanting to fuel my body with good food (80% of the time) – it’s true that feeling great is addictive! With Urban Remedy, I decided to undertake a three-day juice cleanse - all their cleanses are available at 10% off the regular price this month if you choose to try! I'd like to take you through my three days of cleansing - the first time I've undertaken a full time juicing challenge for three full days. Okay, I did buckle here and there with a bite, lick and taste of the kids' food...I'm only human). Read on for my experience! Improve complexion – Bring on that summer glow! So that’s exactly what I needed after the holidays. I feel like I’m getting something more with the Remedial Cleanse range. It does the job of cleansing, but I like the fact the nutrients are boosted for specific tasks - in my case get the weight down, bloating and feel better. I’m pretty healthy so I’m told that for me this cleanse will be easy to manage. Those new to Cleansing should start with the Soft Cleanse from the Signature range. I was feeling excited, but admittedly slightly nervous, as my belly has been so full following the festive season, on top of my buffet meals from the cruise holiday. I started the day with a sip of Mother Tonic, which helps accelerate detoxification and seemed to suppress my appetite. I added 1-2 tablespoons of Mother Tonic to warm water three times a day. This was easy to do as I was drinking 1-2ltrs per day. I like it, it feels super healthy almost medicinal. 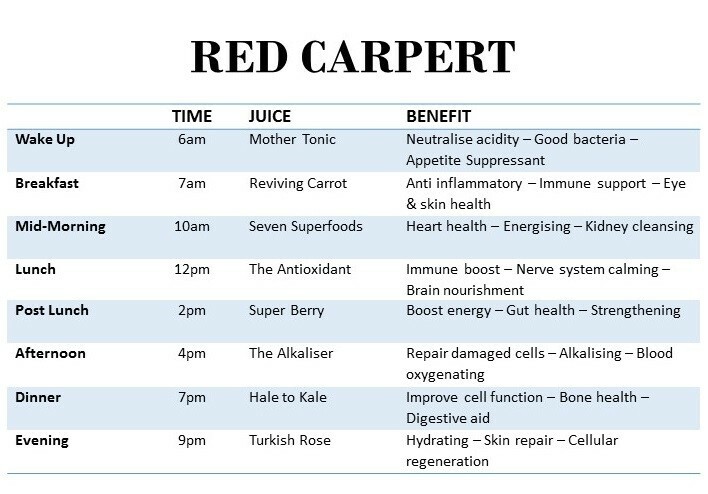 WOW - The Seven Superfoods and The Alkaliser – these are raw raw raw! You are not drinking them for the taste – they are my least favourite but you can feel the good they are doing! Label says they are ¾ vegetable! That’s a lot of green. I’m still super excited, really motivated and to be honest not hungry! The juices are good. I woke up early, feeling fresh and energised. Once again, I started the day with a sip of the Mother Tonic before taking off on my morning beach walk. Later that day I had to bring my bottle of Hale To The Kale to an appointment I had. You definitely feel like you want the sensation of chewing! And often my mind drifted off to a BBQ dinner. Again not hungry – but did like crunching on some nuts. I started the day with my usual early morning walk, bringing along my cooler bag with the Reviving Carrot juice. With Carrot, Orange, Lemon, Tumeric and Ginger, this definitely gave me energy to kickstart the day! Next I did my work out and played with my kids. The Pure Green Juice Seven Superfood was up next making my face shrivel with that sour, but delicious lemon tang! I couldn’t resist tasting some of the kids’ watermelon at their snack time – oops! Today’s highlight was the Super Berry. It was so delicious and filling, loaded with Berries, Mango, Banana, Coconut water, Chia Seeds, Probiotics and Bee Pollen. A real dessert treat! Yum. With Day 3 done and dusted I’m feeling pretty good. Three days has been perfect – it’s so nice to feel myself again. I had a couple of those ‘screwed-up face’ moments with some of the raw green juices that tasted quite sour – I’ve definitely got more of a sweet tooth! But I got over that taste quickly as I reminded myself of all the goodness kale, parsley and lemon had to offer my body. I really liked the cooler zipper bag – this made life easy when packing the kids’ snacks and keeping the sand away when we were at the beach or the park. Super convenient! All in all, the cleanse made me feel much lighter and less sluggish. It did take a while for my brain to accept the fact I wasn’t eating solids. But what I found most important was learning to listen to my body and not beat myself up if I did have a little snack – this is not giving up, nor is it cheating! – such as some nuts and additional fruit when I was feeling peckish. Overall I feel full of energy, which made me realise the process is a case of ‘mind over matter.’ Most days I had moments when I forgot I was on a juice cleanse and helped myself to the kids’ snacks. But this is not a fast and I wasn’t eating main meals – only occasional, healthy snacks. So I was cool with that! Each month I like to set a small challenge. I’d like to invite you to join me in ‘drinking it off’, to help feel lighter, brighter and more motivated to kick off 2016. I’ve teamed up with Urban Remedy this month to start the year on a natural high, and I’m thrilled to offer you a special 10% discount code – simply enter DRINKITOFF at checkout.